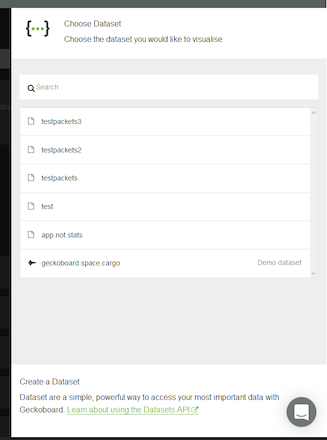 Geckoboard (http://www.geckoboard.com) allows you to create dashboards for large sets of data. These dashboards are comprised of various widgets, each displaying your data in a particular way. The Geckoboard notifier supports two of these widgets: the Number & Secondary Stats widget and the Data Set widget. The type is set in the edit dialog of the Geckoboard notifier via the Widget Type dropdown. The Value field of each of these is the JSON key of the given data point you wish to display. NOTE: This key should be lower case since Geckoboard only supports JSON keys with lower case values. Click on Add Widget and on the subsequent screen, select Custom Widgets. From this collection you can select the Number & Secondary Stat widget. Ensure it is set to the push method. After the Number & Secondary widget appears in the dashboard, hover the mouse on the icon and select the 3 dots on the bottom right corner. This will allow you to edit the widget to see the Widget Key, you will need to enter the Widget Key and the API Key related to your account into the Notification Target. The Data Set is designed to replace the current widgets by making it so users can characterize the incoming data. This makes it so you can create any type of widget from a dataset. Creating a dataset is relatively straight forward, a dataset is designed to map JSON keys to what their value represents. More details are available here: API Reference. To create data sets you need to define the exact fields that appear in the data set by specifying them in a curl command. The key for each index is the exact key that exists in the JSON that is passed to Geckoboard. To create the widget, simply select the dataset that you just created via curl in the add widget menu. Select your dataset you are updating and customize which widget you want to display the data. Datasets will save the data long term and will allow you to graph historical data. Specify the API Key and Widget Key into the provided Notification Target fields. For a Widget Type of Stats, specify the Text and Value fields as necessary. For a Widget Type of Data Set, specify the Dataset ID.